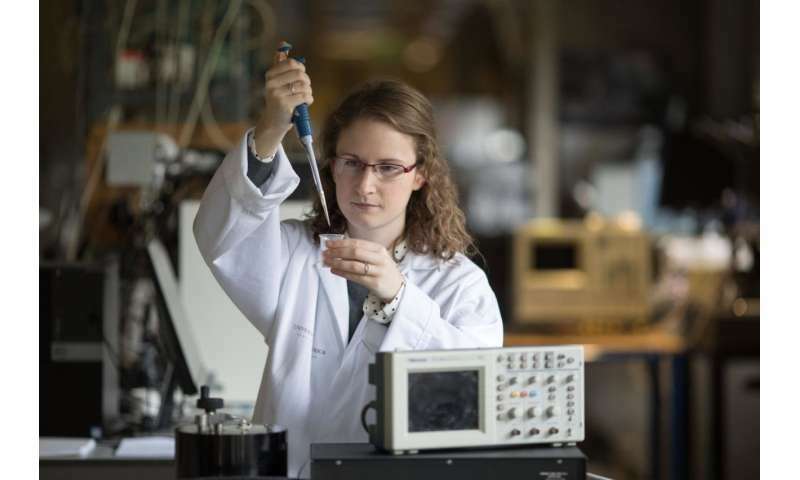 Aimee Stapleton, Irish Research Council EMBARK Postgraduate fellow at University of Limerick, Ireland and lead author of The Direct Piezoelectric Effect in the Globular Protein Lysozyme published in Applied Physics Letters, October 2017. Credit: Sean Curtin, TrueMedia. "While piezoelectricity is used all around us, the capacity to generate electricity from this particular protein had not been explored. The extent of the piezoelectricity in lysozyme crystals is significant. It is of the same order of magnitude found in quartz. 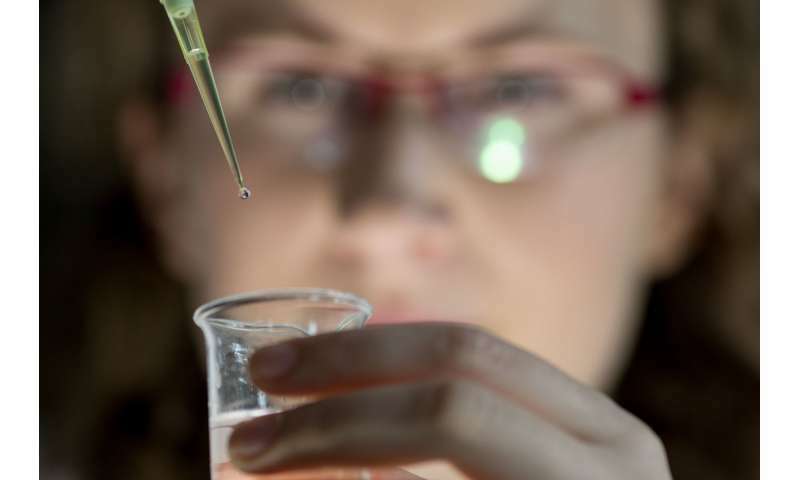 However, because it is a biological material, it is non toxic so could have many innovative applications such as electroactive, anti-microbial coatings for medical implants," explained Aimee Stapleton, the lead author and an Irish Research Council EMBARK Postgraduate Fellow in the Department of Physics and Bernal Institute of UL. Crystals of lysozyme are easy to make from natural sources. "The high precision structure of lysozyme crystals has been known since 1965," said structural biologist at UL and co-author Professor Tewfik Soulimane. "In fact, it is the second protein structure and the first enzyme structure that was ever solved," he added, "but we are the first to use these crystals to show the evidence of piezoelectricity". The authors of The Direct Piezoelectric Effect in the Globular Protein Lysozyme (L to R) John Sweeney, Aimee Stapleton and Vincent Casey of University of Limerick. Credit: Sean Curtin, TrueMedia. According to team leader Professor Tofail Syed of UL's Department of Physics, "Crystals are the gold-standard for measuring piezoelectricity in non-biological materials. Our team has shown that the same approach can be taken in understanding this effect in biology. This is a new approach as scientists so far have tried to understand piezoelectricity in biology using complex hierarchical structures such as tissues, cells or polypeptides rather than investigating simpler fundamental building blocks". Aimee Stapleton, IRC EMBARK Postgraduate Fellow at University of Limerick and lead author of The Direct Piezoelectric Effect in the Globular Protein Lysozyme published on October 2 in Applied Physics Letters. Credit: Sean Curtin, True Media. 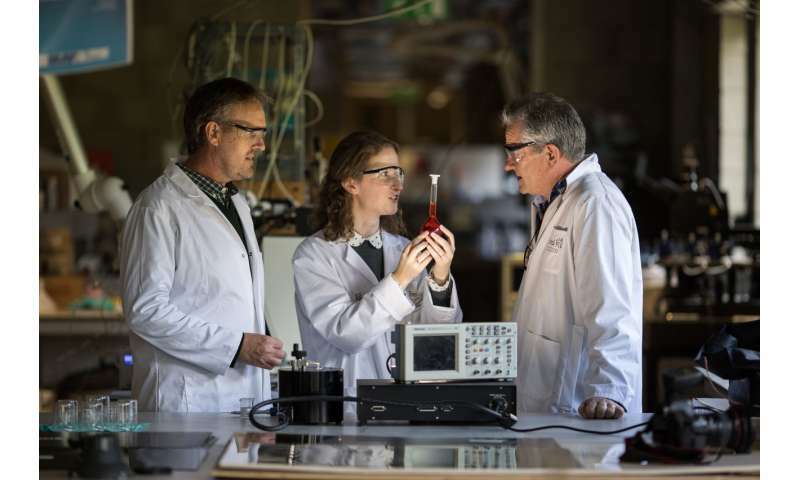 Professor Luuk van der Wielen, Director of Bernal Institute and Bernal Professor of Biosystems Engineering and Design expressed his delight at this breakthrough by UL scientists. "The Bernal Institute has the ambition to impact the world on the basis of top science in an increasingly international context. The impact of this discovery in the field of biological piezoelectricity will be huge and Bernal scientists are leading from the front the progress in this field," he said. The full paper, The Direct Piezoelectric Effect in the Globular Protein Lysozyme, by Aimee Stapleton, Mohamed R Noor, John Sweeney, Vincent Casey, Andrei Kholkin, Christophe Silien, Abbasi A. Gandhi, Tewfik Soulimane and Syed A M Tofail, is published in Applied Physics Letters (October 02, 2017). Maybe we can wire up Third World orphans and whip them so their tears can power our iPhones. Or even better, whip the people who make our iPhones. Things are looking good here. Perhaps all of the snowflakes in our colleges can produce something useful with their angst. They can put collection trays in all of the safe spaces. Moderator, can we get rid of the snide unidentified commenters and allow only peer-reviewed authors (like me) to comment? You call a solid 1.3 voter average a 'peer review'? Well...In that case I guess you didn't pass it.